Patients who receive banked blood transfusions are more than twice as likely to die in the first 30 days from increased risks of heart attack, heart failure, and stroke. Researchers at Duke University believe that banked blood becomes depleted of nitric oxide and is unable to carry blood to tissues. So, giving transfusions of stored blood actually worsens oxygenation of tissues. A study which compared true acupuncture with sham acupuncture failed to find any significant difference between the treatments. Treatment was given at private acupuncture clinics in Seattle, Washington. 100 adults with fibromyalgia received twice weekly treatments for twelve weeks consisting of either non-individualized ‘true’ acupuncture or one of three different sham interventions: i. Acupuncture for an unrelated condition, ii. Needling of non points, or iii. Non penetrative simulated acupuncture. The results of the three sham interventions were pooled. Patients in all groups improved very early in the treatment process (within one or two treatments) and then remained at the same level for the rest of the study. (Annals of Internal Medicine, July 2005, vol. 143, issue 1, pages 10-19). In another study, fibromyalgia patients treated with six sessions of acupuncture experienced significant symptomatic improvement compared to a group given sham acupuncture. 50 patients with moderate to severe, recalcitrant fibromyalgia, for whom other symptom-relief treatments were ineffective, were randomly assigned to receive acupuncture or sham acupuncture (neither group knew which), administered in six sessions over two to three weeks. Ed note: In these studies, a protocol is followed, regardless of what the examination of the patient would suggest. This is why studying acupuncture in the same way that pharmaceuticals are tested against placebo is using the wrong investigative tool. Like using a microscope to study the sky, these researchers will never learn anything and will continue to waste money and time, as real Oriental medical practice requires that the treatment be changed as the patient responds. Fans of centralized medical systems and electronic medical records may not be sobered by the ongoing episodes where records are lost or stolen, but these events will continue and the data will be mined by criminals and other troublemakers. The most recent security breach involves roughly 160,000 medical records. It has been estimated that the data could be worth up to "1.5 billion British Pounds" to criminals. Despite the absence of any evidence that these expensive systems create benefit for patients or physicians, the pressure to mandate EMR's is still extremely high. The most recent episode in the UK proves the National Health Service is unable to maintain security over its own records. In fact, these systems will never be secure. All participants received six weeks of acupuncture: the first three weeks at acupuncture points designed to treat digestive symptoms and the last three weeks at non-points near actual points not indicated for digestive disorders. A German trial compared ‘true’ acupuncture, sham acupuncture and no acupuncture in 270 female patients suffering from episodic or chronic tension-type headache. The acupuncture protocol, which was carried out at 28 different clinics, was developed through consultation with various German acupuncture experts and societies and delivered by practitioners with a median of 500 hours training and 10 years practice. Main points were Fengchi GB-20, Jianjing GB-21 and Taichong LIV-3, with secondary points chosen from a list according to pain location and inducing factors such as weather conditions (e.g. cold wind: Hegu L.I.-4, Lieque LU-7, Waiguan SJ-5 and Dazhui DU-14). Twelve treatment sessions were given over eight weeks, deqi was obtained and at least one further needle stimulation was given during retention. In the minimal acupuncture group, patients were needled at a minimum of five non-points at the same frequency as the true acupuncture, but without obtaining deqi or applying manual stimulation. Patients in the control group received no treatment for twelve weeks and were then given acupuncture. The number of headache days decreased in both acupuncture groups (6.5 in the true acupuncture and 6.0 in the minimal acupuncture group) compared to a 1.5 reduction in the controls, but the differences between the two acupuncture groups was not significant. The fact that injuries and wounds heal faster when treated by acupuncture may be explained by research at the Austrian Institute of Molecular Biotechnology in Vienna and the University of Aberdeen in the UK. Researchers have discovered that they can affect tissue healing by applying electric currents, either accelerating or halting the healing process by altering the strength and orientation of the field. This phenomenon was reported 150 years ago by the German physiologist Emil Du Bois-Raymond, but has been ignored by subsequent generations in the West. A twelve country analysis of the environmental impact of broken marriage indicates that the move to separate properties results in a higher demand for space, energy and water per person in the two resultant households. Jianguo Liu of Michigan State University estimates that 2.37 trillion liters of water, 38 million rooms and 734 billion kilowatts of energy would have been saved in just the U.S. in 2005 if no one had divorced. Farmers in China have found that their cotton crop, previously genetically modified to resist the bollworm is now being destroyed by plagues of mirid insects. When genetically modified cotton was first grown in China in the late 1990’s, the yield was hailed as evidence that the technology could benefit poor farmers. A few years down the line, things look a little different. The farmers are now using vast amounts of expensive insecticide to eradicate the mirids, removing the economic benefit of growing GM cotton in the first place. A study of the effect of acupuncture on sperm quality in men suffering infertility of unknown cause, found that after twice weekly treatment for five weeks, there were fewer structural sperm defects (acrosome position and shape, nuclear shape, axonemal pattern and shape, and accessory fibers of sperm organelles) and an increase in the number of normal sperm ejaculated. Other sperm abnormalities such as immature or dead sperm were not affected. And in the Merseyside and Cheshire health districts in Britain, the number of men seeking treatment for infertility has risen by nearly 70% in the past four years with ICSI now accounting for 60% of the ICSI/IVF treatments carried out at the Liverpool Women’s Hospital. In a Taiwanese study, 40 patients with refractory uremic itching were randomized into two groups. In one group Quchi L.I.-11 was needled three times a week for one month (true acupuncture group), and in the second group a non-point (2cm lateral to Quchi L.I.-11) was needled with the same frequency (sham acupuncture group). Point specific acupuncture is effective in treating vocal disorders arising from benign pathological tissue changes according to a recent study. Twenty four subjects with dysphonia were randomly assigned to either an experimental group or a placebo group. The experimental group received acupuncture on Renying ST-9, Lieque LU-7 and Zhaohai KID-6, which are all related to improving throat problems and vocal function, whereas the placebo group received acupuncture on Houxi SI-3 and Kunlun BL-60, which are not normally used to treat voice disorders. All subjects received 10 intensive acupuncture sessions within a 20-day period. Acoustic analysis of voice range profile, perceptual analysis of voice quality, and self-perceptions of quality-of-life measurement by patients were the outcome measures for determining treatment efficacy. A herbal supplement known as GETO, containing Ren Shen (Ginseng Radix), Yin Yang Huo (Epimedii Herba), Yuan Zhi (Polygalae Radix) and two other unnamed herbs might help prevent dementia. Seventy-five patients with mild cognitive impairment were given either GETO, piracetam (a drug thought to improve cognitive function) or placebos for three months. Those who took the Chinese herbs demonstrated significantly improved cognitive function at the end of the study and at one year follow up, compared to the other groups. A nationwide appeal was launched in China to track down any remaining stores of Angong Bezoar Pill in the hope that it could rescue a three-year old boy who remains in a coma after a brutal kidnapping. The pill has not been produced in China for ten years after it was banned due to its use of imported Brazilian rhinoceros horn. Ed. Note. Regardless of what "Doctors say", physicians have an obligation to respect the sources of their medicine. A skilled physician can certainly find effective substitutes for rhinoceros horn. Finding reasonable alternatives for endangered species is an ethical imperative. DO PATIENTS NEED ANOTHER CLASS OF PHARMACEUTICALS AND A NEW "PROVIDER"? The FDA is evaluating the option to allow pharmacists to effectively prescribe a new class of drugs which will not require a physician’s prescription. These are at the moment labeled "behind the counter" drugs as opposed to "over the counter" drugs which patients can obtain themselves. Advocates claim that pharmacists are knowledgeable enough to ensure correct use of the drugs and to provide patient education, and that behind the counter access "could help uninsured patients get certain drugs that are currently only available with a prescription". As a natural extension of direct to consumer advertising, for some drugs the message will be "don’t bother to ask your doctor". If the physicians and their counterbalancing advice can be eliminated from the equation, increased utilization is certainly to be expected. It is, however, important to question whether "help(ing) uninsured patients get drugs" will improve their health or threaten it. It is also not clear how insurance status is relevant, though the medical establishment and their media mouthpieces are always on the lookout for a way to co-opt the "uninsured". It will be interesting to find out if this new class of pharmaceuticals creates another level of profits for the manufacturers and the pharmacies. It is easy to imagine that the most likely result of this proposal is to boost the profits of the drug companies by allowing a higher price for “behind the counter” than “over the counter” drugs. This proposal will further fragment medical care by having pharmacists become "providers". Pharmacies are already serving as quasi diagnostic centers by providing or "hosting" blood pressure, ultrasound and blood chemistry "screenings", most of questionable benefit. Such a program will raise overall costs by creating a need for another set of diagnostic and procedure codes for pharmacists’ "educational" visits and the always-necessary associated bureaucracy. It is also not clear how pharmacists are to develop clinical skills without specialized training. Pharmacists who prescribe will no doubt require malpractice insurance, pleasing the legal profession by creating a new class of potential defendants. 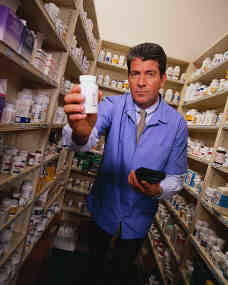 Will pharmacists also schedule follow up visits to see if the drugs are working or causing interactions or side effects? Will professionalism require them to advise against their employer's drugs on some occasions, perhaps risking their livelihoods? The overall effect to the U.S. economy of providing this "help" to the patient may not be so inexpensive, after all the accessory costs are considered. Perhaps requiring a dose of "evidence based medicine" of the FDA would be a good thing before another widescale experiment in medical social engineering is proposed. There doesn't seem to be any evidence to suggest that creating a new category of drugs will improve outcomes or provide any benefit. The burden of proof for the FDA, pharmacy fat cats, and special interests should also be to establish that more prescribers and more drugs will not lead to more incompetent prescribing, adverse side effects, or drug-drug interactions.